When you are thinking about getting a tattoo, it can be difficult deciding on a design because there are so many to choose from! 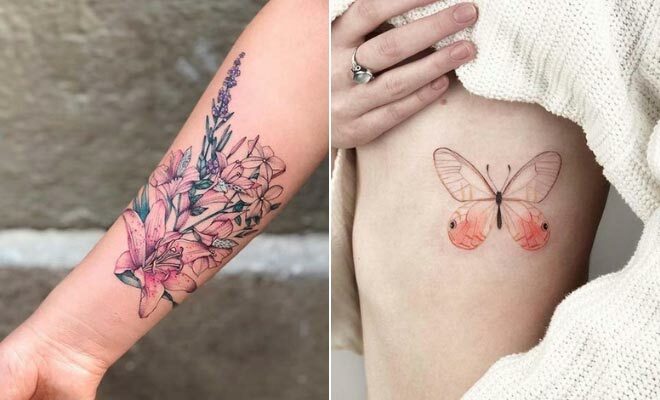 So, we have done some of the hard work for you and found 43 of the most beautiful tattoos for girls. You will find butterfly body art, elegant floral designs, adorable animals, magical tattoos and more. You will find the perfect tattoo here, we guarantee it! There is something for everyone. 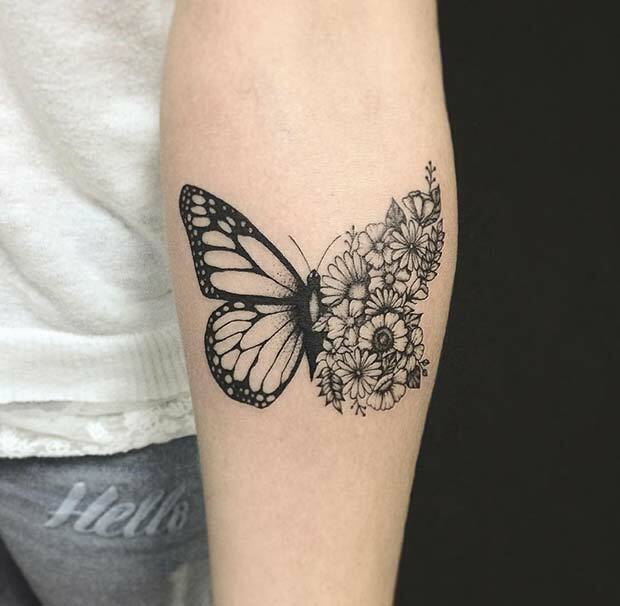 To start off, we want to show you this unique butterfly tattoo. The tattoo features a butterfly with one classic wing and the other wing has a beautiful floral design. We love this creative version of the popular butterfly tattoo and the floral wing is stunning. You can recreate this tattoo or create your own butterfly design with your favorite flowers. Our next idea is magical! Here we have an enchanting unicorn tattoo. 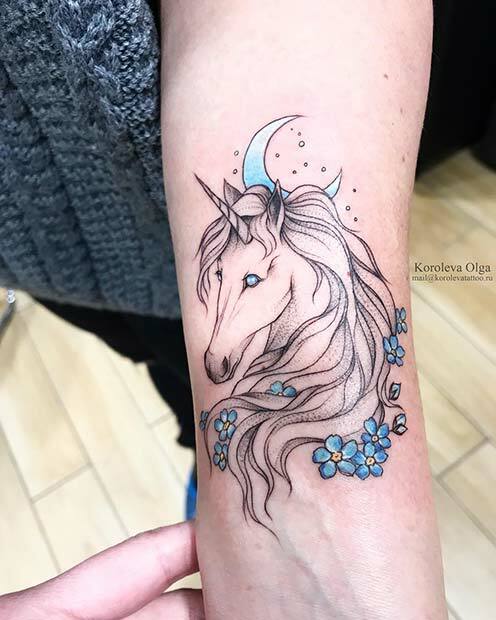 For this design there is a beautiful unicorn with a moon and blue flowers. A tattoo like this is perfect for anyone who loves these mythical creatures! Have a unicorn with a blue theme like this or try a different color. Pink or purple flowers with a unicorn would look amazing. A popular flower used in tattooing is peony. The peony can symbolize many things including love, good fortune and beauty. So, not only do they look gorgeous, but they have a wonderful meaning too. 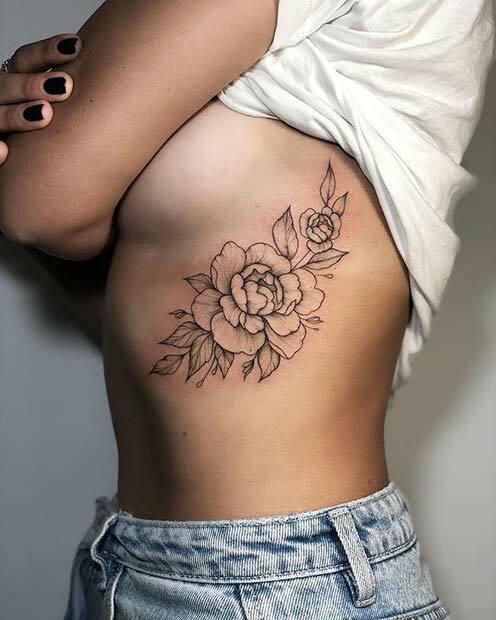 This tattoo features a peony design on the ribs. A rib tattoo like this one is stylish, feminine and will suit everyone! Next, we have a dream catcher tattoo idea. This design is a small dream catcher with delicate feathers and beautiful flowers for decoration. 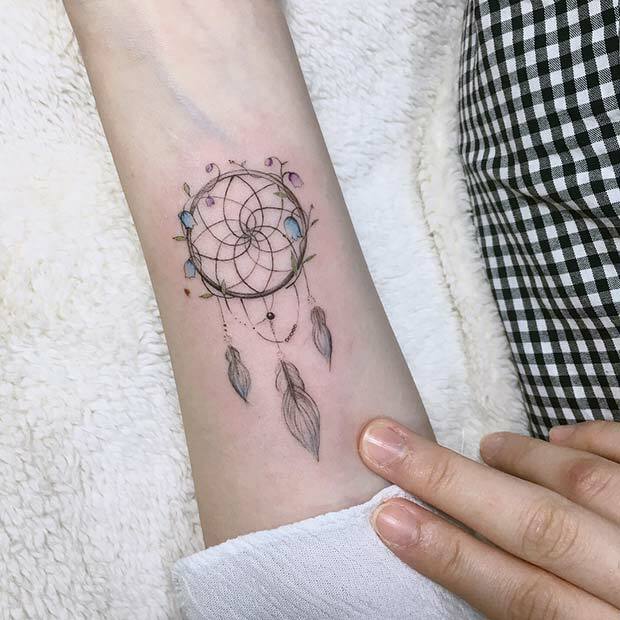 You can choose a similar tattoo to this one or use it as inspiration and create your own stunning floral dream catcher design. Either way, a dream catcher will be a timeless tattoo that you will love for years to come. Looking for body art that is pretty and glam? Then we have just the design, check out this gemstone tattoo. 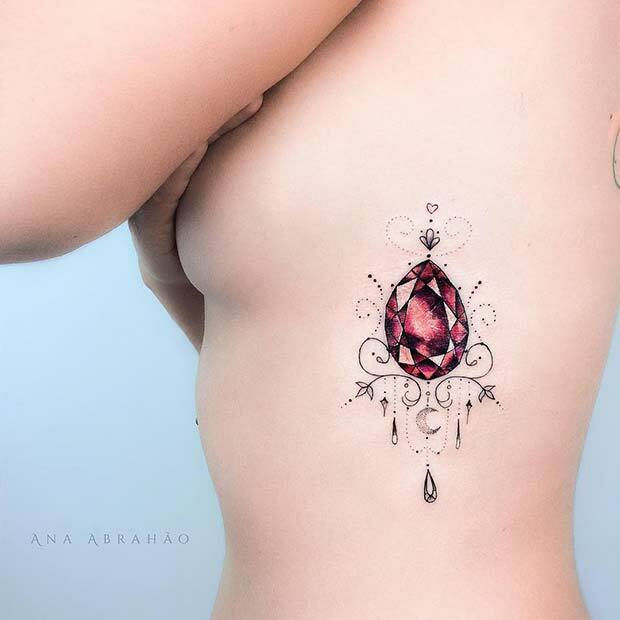 The rib tattoo is a red jewel with beautiful patterns and decorations around the outside. Recreate the red gem or make the design unique to you by choosing your birthstone or a crystal in your favorite color. Blossoms are another floral favourite used in tattooing and here we have a creative and unique version of the much loved flower. 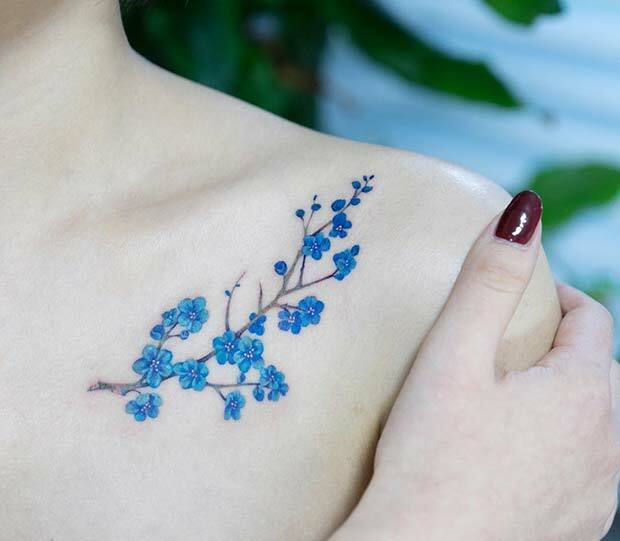 This design features bright blue blossoms that have been tattooed just below the collar bone. It is a tattoo that makes a statement. You can have similar blossoms tattooed or try blue blossoms elsewhere on the body, a rib tattoo would look amazing! Our next design is a beautiful bird. 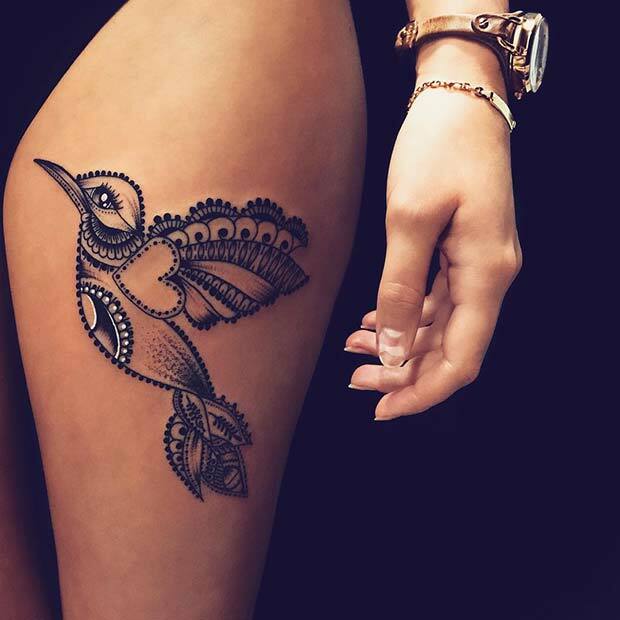 We love this tattoo because the bird has stunning patterns and is very detailed. It is a very unique and artistic piece of body art. Recreate a bird like this one or try a different type of bird with different patterns. The design possibilities are endless! Next, we have a floral arm tattoo. The design features stylish stripes and beautiful flowers. 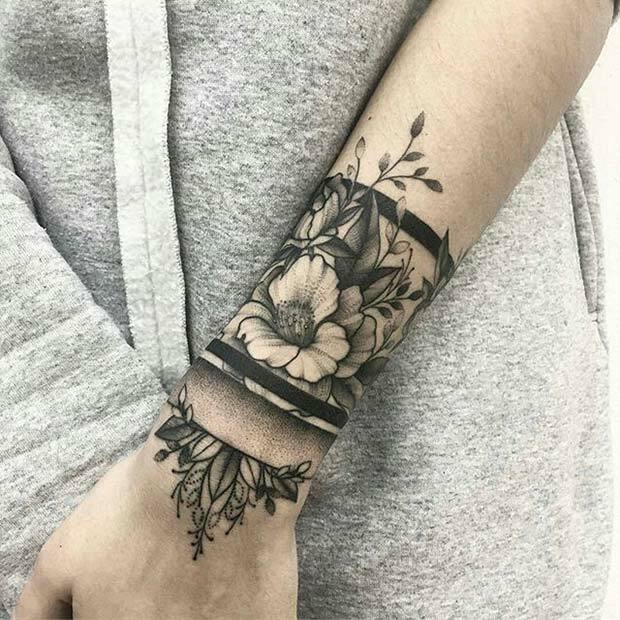 A tattoo like this is perfect for the ladies who want a flowery tattoo but want it to look trendy and bold instead of bright and dainty. You can create a tattoo like this one or try a different striped pattern and choose your own favourite flowers. 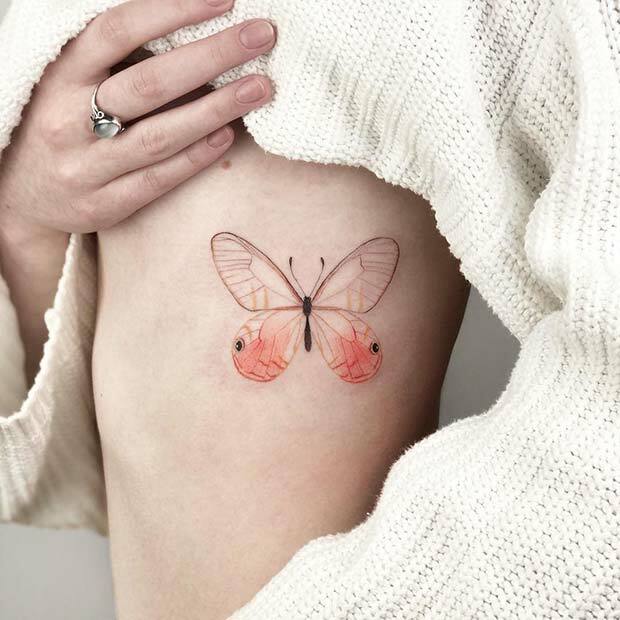 Love butterfly tattoos? Then you need to check out this design! Here we have a stunning butterfly rib tattoo. This tattoo is one of our favorites because of the colors and elegant wing design. The color used on the wings is only subtly added which gives it a soft and delicate look. A tattoo like this is just beautiful. Sternum tattoos are stylish and bold. Next, we have a gorgeous example of one of these popular tattoos. This one features a pretty lotus design. The patterns and shading used in this is amazing, it is an elegant piece of body art. 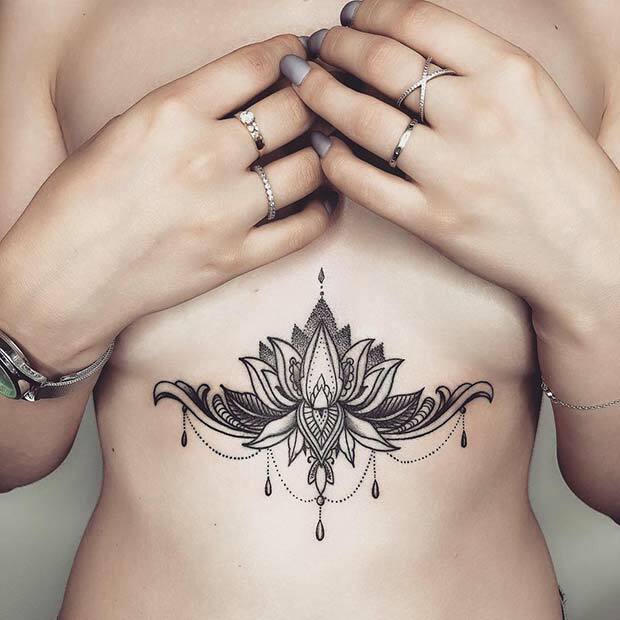 There are many lotus sternum designs so, you can choose a patterned one like this, or maybe try a simple lotus with a splash of color.